Pez has been making candy and dispensers for over 50 years and they make Thomas & Friends Pez too! We thought it would be fun to create this page to illustrate all the Thoms Pez characters to collect and yes Adam and Charles have this collectors lunch box and the other characters too. 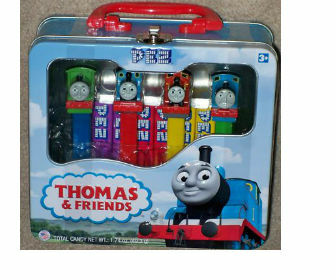 New Thomas The Train Collectible Tin Tote Pez Candy Set. PEZ - 1 Thomas the Train works fine!